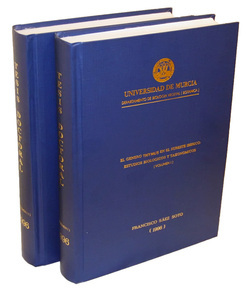 The doctoral thesis entitled EL GENERO THYMUS EN EL SURESTE IBERICO: ESTUDIOS BIOLOGICOS Y TAXONOMICOS (The Genus Thymus in Iberian Southeast: Biological and Taxonomical studies) comprises studies developed from 1989 to 1996 with the aim to characterize a number of biological characteristics of thirteen species of the genus, present at Southeastern Spain, most of them endemic to the area. The aspects studied were (1) the distribution and relation to plant communities from a biogeographical point of view, (2) the essential oil composition and yield, (3) the leaves versus wooden parts yield, (4) the relationship between the analytical variables and the biogeographical variables, (5) other aspects, including caryology, presence of isoproteins, and behavior when cultured in vitro. The thesis extends along 1088 pages, plus indexes, summaries, etc., and it is divided into two volumes. Most parts of the dataset have not been published, due to the start of other different projects, but a good review of many aspects on Thymus can be found at the book 'Thyme. The Genus Thymus'.